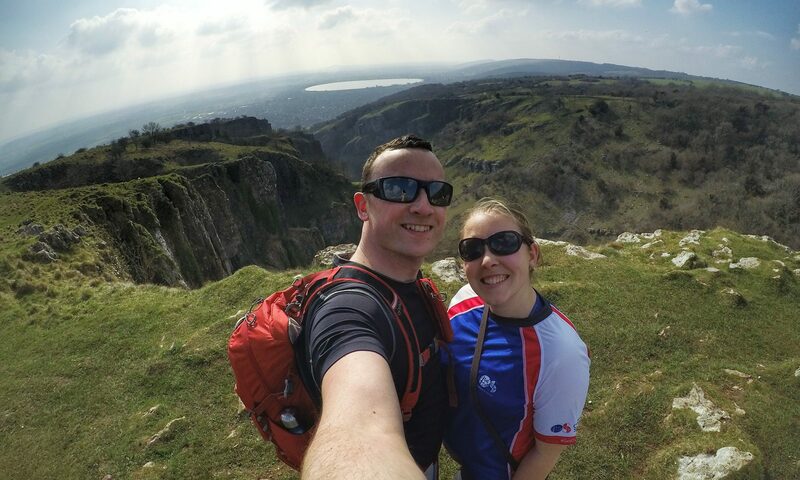 Last week Mark and I went on a break to the Lake District – neither of us had ever been to that part of the UK before, and we both love camping so decided to go for a few days to explore and chill out. We hired bikes from the campsite we were staying at in Low Wray on the western edge of Lake Windemere (£20 each for the day), and did a route that looked something like this – but not exactly! I think it was probably a bit longer due to going down some tracks before changing our minds (!) and also not being able to exactly follow the paths on MapMyRun (I drew this afterwards). Cycling round the edge of Lake Windermere was gorgeous. We cycled about 5miles south before taking the ferry across to Bowness-on-Windermere, the main touristy town on the eastern side. We stopped for some lunch and a wander round before heading back across to carry on exploring. Then there was some “dirt bike” cycling on uneven cobbled tracks and scree slopes, past some amused sheep. The views were amazing and it was so lush and green. I’m pretty sure I’m leaning on the bike to hold me up by this point! My legs were so achey afterwards! We arrived back around 6pm, so really got our money’s worth! There were times when I thought I was going to be sick trying to cycle up some of the steep slopes, and it was equally scary flying down the insane downhill inclines hoping my brakes didn’t fail! 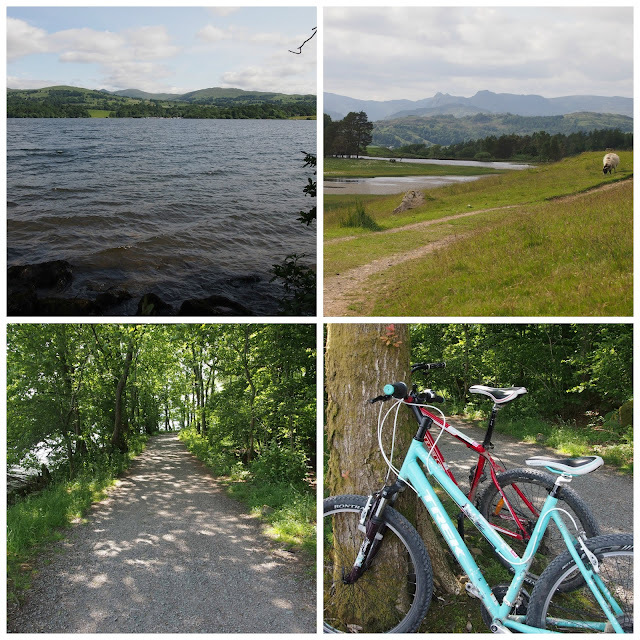 But I really enjoyed it – it was a great way to see the countryside and I would definitely recommend it for exploring the Lake District in a different way. Just pack your strong legs! This was a short trek through the forest to see the Aira Force waterfall on the north side of Ullswater, which drops an impressive 65ft into the gorge. The weather got progressively wetter on Friday so we got rather soaked on our second walk, an approximate 3mile loop to see another waterfall, on the edge of Thirlmere Lake. And we should have expected to get wet really with the Lake District being the rainest place in England! The rain mist across the lake and the valley looked rather impressive, even if it was dripping off my nose in a most unflattering way…. What’s your favourite activity to do whilst on holiday? This holiday sounds right up my street Beki – lots of outdoorsy adventures 🙂 Am so jealous of everyone cycling at the moment, the boyfriend is going to try and teach me on our holiday – going to the South of France on Sunday, hooray! Am hoping for plenty of walks, swimming and yoga whilst we're there (as well as plenty of delicious French food too 🙂 ) My friend runs a B&B by Lake Windermere so I can't wait to visit – by the way, how did you travel there and how long did it take? It seems quite far on the map! Glad you survived the Race For Life in extreme temps, am doing mine this Sat so hopefully it wont be as sweltering..! Thanks Lucy – it was great fun 🙂 Hope you have fun in the South of France – that sounds awesome!